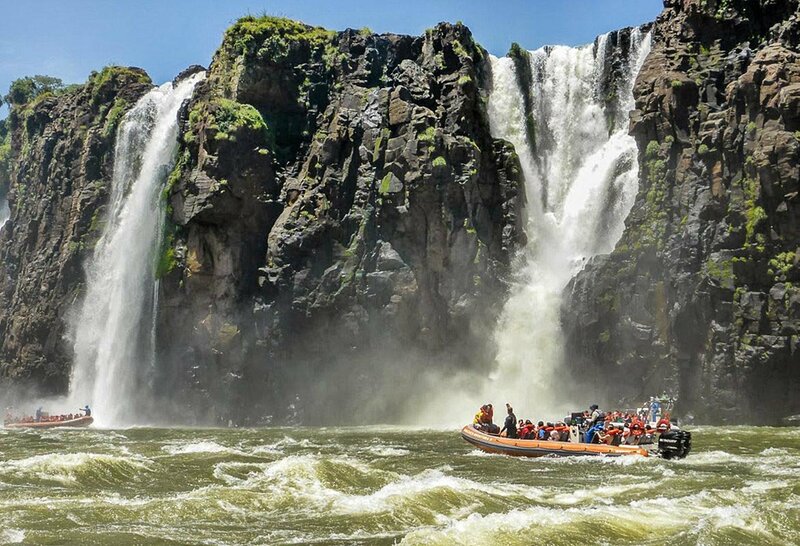 Get ready for a unique, up-close view of the mighty Iguazu Falls! 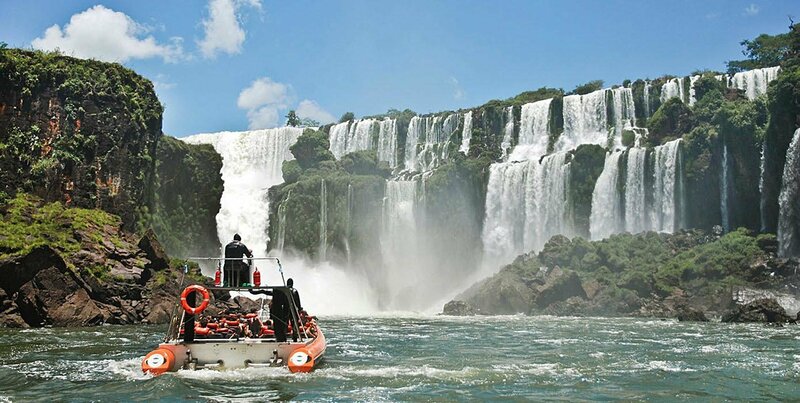 Get ready for a fantastic speedboat adventure, enjoying a unique, up-close perspective of the majestic Iguazu Falls. This tour experience makes for a different point of view from you will have seen from the panoramic boardwalks. 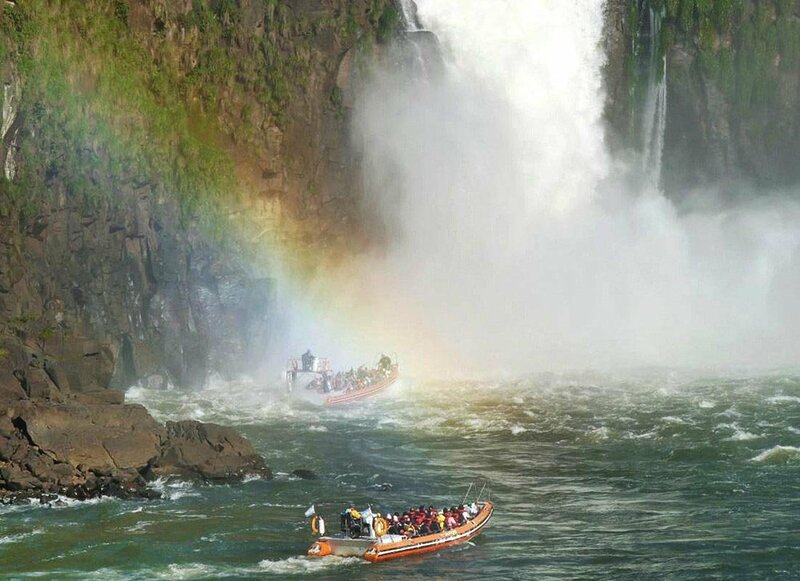 Our speedboat will zip the waters of the Iguazu River, and approach the falls, getting right inside the mist formed by their thunderous splash! You’ll be thoroughly splashed by the mist of the falls, as you take in the water’s imposing roar. This ride provides a unique and extremely close-up view of the San Martin and Three Musketeers falls. The high point of this experience will be without a doubt, being showered under the mist of the San Martin Falls; the second strongest falls in the Iguazu system. The starting point for this tour will be a dock located in the middle of the Lower Circuit. After climbing down a long and steep staircase, we’ll arrive at the dock and be given our life vests along with a waterproof bag for storing cameras, cell phones, and anything else you may want to protect from water. 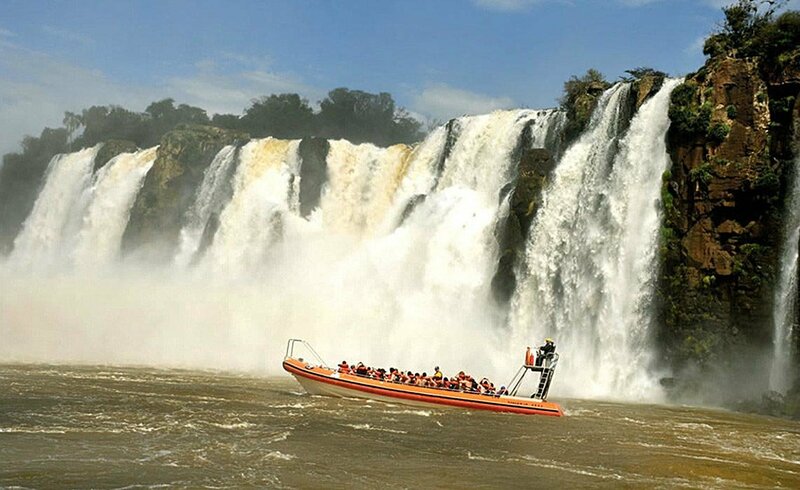 Our navigation will place us on board a triple-engine speedboat, providing plenty of power and safety to take on the mighty falls. Now, it’s time to hop on board and begin our waterfall adventure! Difficulty: the boat ride is easy, however travelers must climb down (and back up) a staircase with a total lenght of 330 feet (100 meters) to get to the boarding dock. This may be hard for those with walking difficulties. The minimum age required for this tour is 12 years old. Travelers with heart conditions or surgery; neurological conditions or surgery; chronic pulmonary diseases; or any person with any physical, cognitive and/or sensorial disability unable to react in a nautical emergency won’t be allowed for this tour. Pregnant women are also not allowed for this tour. Duration: 12 minutes. 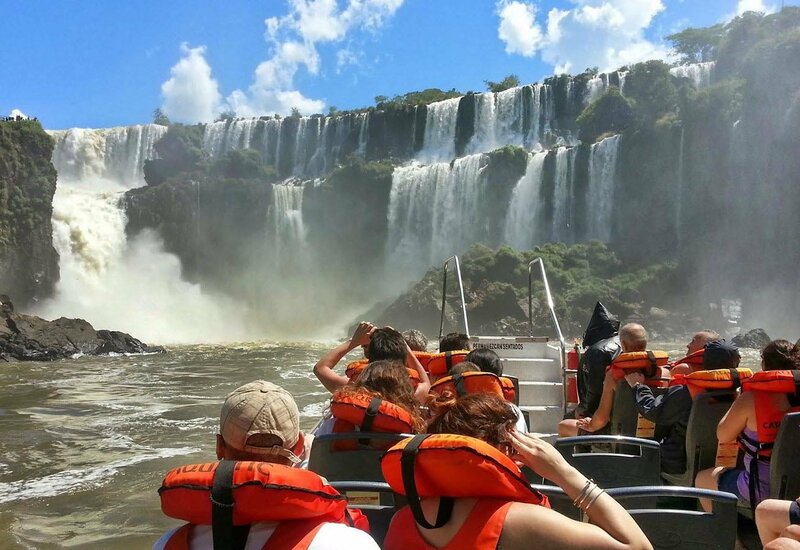 This tour is done on the same day you do the Argentinean side of the falls tour. Guide: this is not a guided tour. Vehicle: Triple-engine motorboat for the boat ride. The boat’s maximum capacity is 45 travelers.